Little by little I have started to add in some fall decorating. 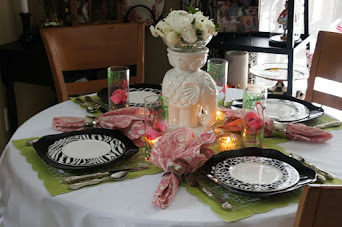 I was inspired by a picture of a centerpiece by Vignette Designs from last year. I found this large metal tray and had all sorts of ideas for it. While browsing through Vignette Designs previous posts I came across this picture that inspired me. I came across a wreath that had a combination of leaves, pine cones and sunflowers on it. I set a wooden pedestal base in the center and laid the wreath inside. I found the metal pumpkin at our Hallmark store and I was pretty sure this was going to be what I wanted to stage in the center of this design. I didn't set out to copy her design 100% but the formula with the candles at the sides and the pumpkin in the middle was definitely what I wanted to utilize. When I started to build mine I quickly found out that I had to raise the pumpkin and the candle holders higher because of the high sides on this try and the leaves and gourds were absorbing them. I have a combination of faux and natural elements in this arrangement. and the wooden pieces all on sale at Michaels. Good thing is they can be re-used for other designs! This is another vignette I set up on a long wooden top of some cabinetry that divides our dining area from the living room. I already owned everything except the urn and one pumpkin. I like to find a new ways to decorate with the same things I already own. In fact some of these can be seen in one of my first postings a year ago. I found a pair of the urns at Michaels marked to $9.99 and I got another 20% off last week. I think they will come in handy for future designs! I also added some faux leaves to the bottom of the pumpkin sitting on the urn and I added a few to the metal leaves on the faux pumpkins. I found a picture on the internet of a scary witch in a field. I printed it on paper and inserted it in this frame to add a little Halloween into the design. This is a candle votive from Pier 1 Imports last year. They design shows off nicely with a candle lit. I've seen a lot of great ideas out that in blog land. Check out some of the many ideas others have posted! There is some great stuff to see! I love that witch print. I just printed one too LOL! 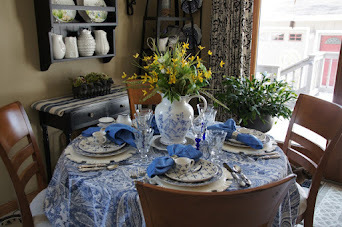 Very pretty vignettes Liz! Happy Fall. The metal tray is gorgeous. You should be able to get so much use out of it! Everything looks so nice!!! You've been busy and I'm still in paint purgatory!! I love your arrangement between the dining area and your living room and its so nice that you can see it from several rooms! Hey Liz! Thanks for stopping by this morning and leaving such sweet comments!! Your vignette looks great; and your metal pumpkins are awesome!!! That was a great copy, with your own spin on it! Love what you've done! I didn't think anyone saw me standing out in that field that day with my black outfit on! I need to be more aware that the paparazzi are everywhere!!! :-) Great arrangements, Liz! Your vignette look is gorgeous you always have a eye for beauty in your home. This was a beautiful work of art Liz. 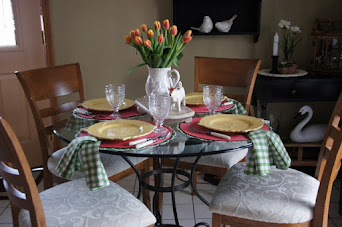 Thanks so much for your comments on my new Tablescape. Looks like your home is ready for fall! I really like the metal tray. So pretty! I love the harvest pumpkin and the printed witch-what a neat idea! 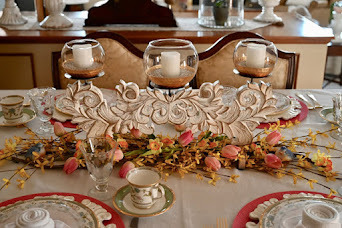 I love the vignette with the copper pumpkin, candle sticks and all the smaller fillers. Great deal on the candle sticks, they will be able to be used lots. Now, that witch is scary!! Thanks for stopping by to see my fall porch, and for your sweet comments. I love finding new blogs for inspiration, so I am going to go poke around. Have a great week! The tray looks beautiful wit the pumpkins and candle holders. We get inspired by others, so it's ok to copy somewhat..it's a huge compliment to the person who did the original. Lovely vignette. It is all beautiful. Great fall decorating. 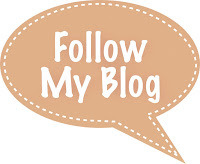 You have a beautful blog too! I really like your metal tray...that will be perfect for decorating for all the Holidays. Ohhh..what a great idea! I love the witch picture! I mean I LOVE IT! Now I want one! I love that idea. Everything looks wonderful..just wonderful! 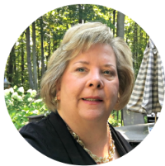 These are fantastic fall vignettes, Liz! I especially love your tray display. The candles even match perfectly with the mat around the picture in the background! Your tray vignette is awesome! I especially love that metal pumpkin. Thanks for visiting me and leaving such a sweet comment. Beautiful vignettes! 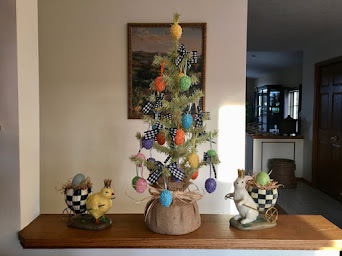 Love your seasonal touches! Thanks for sharing.